Get your students engaged and moving around while learning how to find the slope when two points are given on a graph. Who likes sitting around for the entire period? As a teacher, it’s wonderful to see students move around the classroom, learn, and be engaged at the same time! - Scatter the cards around the classroom and give each student/group a copy of the answer sheet. - Assign or have them pick any card to start with. 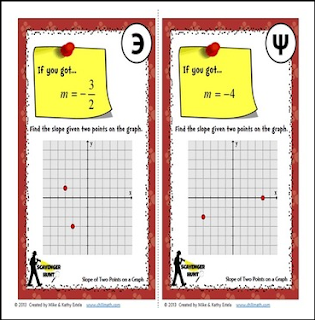 - Before answering the problems, have students copy the symbols first which can be found on the upper right corner of each card. - After solving each problem, students will then look or “hunt” for the next card that contains the answer from the previous problem. Each problem should have an answer that will lead them to the next card to work on. - They will keep repeating the process until they have solved sixteen (16) problems or gone back to the first card they started with. - You may ask the students to show their solutions on paper and staple them with the answer sheets. You may also check their answers using the answer key provided. - Make sure to cut and laminate the cards so you can use them many times. We hope that you find this math resource useful in your class. When you get a chance, please don't forget to provide us a feedback as this helps us improve our existing and future products. If you have any questions, you may email us directly at chilimath@yahoo.com. Thank you! © ChiliMath 2014. This product is intended for single classroom use only. It may be printed or photocopied by the original purchaser but may not be sold, transmitted, or put on the internet/intranet without a written permission from the authors.